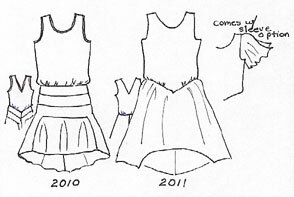 Style 2011 is for the beginner to moderate sewer and comes with an optional sleeve and collar, while style 2010 with a fishtail hem is for the moderate to advanced sewer. Patterns come with sewing directions, layout guide and fabric options. » Allow 2 to 3 weeks for delivery. » Michigan residents must include 6% state sales tax. Small for bust 34' to 35 1/2" and 35" to 36" hip. Medium for bust 36" to 38" and 37" to 39" hip. Large for bust 39 1/2" to 42" with a 40" to 43" hip. If you are taller than 5' 8" or shorter than 5' 3" or ortherwise outside of our offered size range you must fill out our measurement sheet and add $10.00 for special custom sizing and one week extra for custom pattern creation.